Veteran Tickets Foundation (Vet Tix) and Jim Beam® Brand have officially partnered to benefit the Arizona military community of currently serving military members including the Guard and Reserves, veterans of all eras, family members of those killed in action, military spouses, families and caregivers of VetTixers. 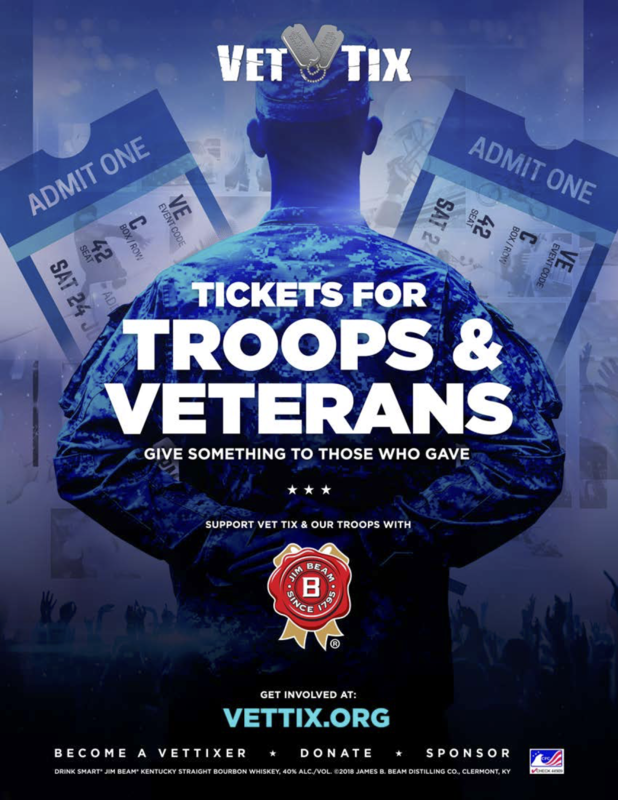 Jim Beam® is the only distilled spirits partner of Vet Tix in the Arizona region and the collaboration will provide the veteran and military community with free event tickets to major entertainment events. Jim Beam® will help to promote Vet Tix branding throughout stores in Arizona, ultimately driving even more VetTixers to take advantage of free tickets. The cross-promotion across each organizations’ networks will reach a significant number of potential VetTixers in Arizona. This Veterans Day, Jim Beam® will host a bottle etching event providing consumers the opportunity to purchase a Beam brand of distilled spirits with the ability to have their bottle custom etched while they wait. The etching event will take place at Fry’s Food and Drug in Litchfield Park, Arizona located on 13730 W. Camelback Road between the hours of 12 to 3 PM. As a national nonprofit, Vet Tix has served the military community with resources and opportunity for reintegration through community-based events. Veterans, currently serving military, dependents, families of those killed in action and caregivers can receive tickets to major sporting games, concerts and a range of other events in the performing arts. Military caregivers are able to receive tickets through the veteran they provide care for. Since its founding in 2008, Vet Tix has distributed more than 3.5 million tickets to more than 650,000 verified VetTixers. Getting to participate in community events once they return from service allows veterans an enjoyable, stress-free experience that helps with reintegration into the community and family bonding. Jim Beam’s® contributions will grant those unique reintegration opportunities and will give military families an opportunity to make memories to last a lifetime. For eight generations, Jim Beam® has provided high-quality bourbon over the last 200 years. Jim Beam’s® commitment to support the Vet Tix mission will directly benefit Arizona service members, veterans and their families. Vet Tix events provide service members and veterans a unique opportunity to spend quality time with one another and family to strengthen bonds. Vet Tix seats are commonly grouped in blocks enabling VetTixers to be seated with other VetTixers at events, helping to promote comradery similar to that experienced while in service. To learn more about Vet Tix and how to get involved, visit VetTix.org. Veteran Tickets Foundation (Vet Tix) is a national nonprofit that supports the military community of currently serving military members including the Guard and Reserves, veterans of all eras, family members of those killed in action, military spouses, families and caregivers of VetTixers - giving them a unique opportunity to strengthen peer bonds by attending events through the VetTixer they provide care for. Vet Tix provides free event tickets with a nominal delivery fee to attend sporting events, concerts, performing arts and family activities to local community events. Since 2008, Vet Tix has provided more than 3.5 million free event tickets to over 650,000 verified VetTixers, giving back to those who have given so much. Attending these types of community events improves morale and strengthens family bonds, while encouraging service members and veterans to stay engaged with local communities. Visit VetTix.org to learn more, and follow us on Twitter and Facebook. Jim Beam® Bourbon was founded in 1795 and has been operated by one family for eight generations. We’ve always created bourbon our way, aging it twice as long as the law requires. 220 years of experience goes into every bottle. Now, Jim Beam® is the world’s #1 selling bourbon and enjoyed by people across the globe.